We looked at hundreds of games and listened to experts to find the best board games for toddlers. For ideas of what to play with your toddler on family game night, read on to see our favorites. There’s nothing more fun than board games. Don’t leave your toddler out. Board games aren’t just fun, they bring families closer together and are great learning tools. What are the best board games for toddlers? The best toddler board games encourage social, visual, and vocabulary development. When choosing a game for a toddler, look for age-appropriate games that are bright, playful, and very simple. For their very first board game, you just want to introduce games with very simple game mechanics such as memory and movement. Carly Klayman, a behavioral therapist, says “Board Games help children learn important social skills.” Board games get toddlers used to taking turns, rolling dice, flipping cards, and moving game pieces around the board. Toddlers are constantly exploring the world through their five senses. If your toddler still loves putting things in her mouth, stay away from board games with small parts. Many board games come with small die or game pieces. With over 50 of the best board games for toddlers, we’ve broken this guide into several categories so even your toddler can participate on family game night. From award winning to popular games, we’ve listed our favorite games for toddlers down below. We’ve chosen games that encourage cooperation, learning, memory, and most importantly fun. Players: 1-4 | Time: 10 minMade by Haba, First Orchard is one of the best board games for toddlers and excellent first game for kids. 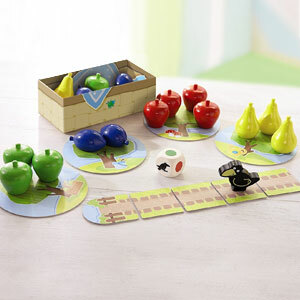 It’s a cooperative game with 16 large pieces of colorful fruit, which are perfect for little hands. The object is for kids to collect all of the fruit before the raven eats it. Roll the multicolored die to determine what color fruit to pick and place it in the fruit basket. If a player rolls the raven, the raven moves closer to the fruit. With great quality and colorful components, it’s great for teaching color recognition and basic game rules, such as dice play and turn taking. Players: 2 | Time: 5 minDesigned for kids 18 months and up, Roll & Play is a great first game introducing them to the basics of gameplay. Little ones will learn colors, numbers, animals sounds and more through play. The game is so simple to play and learn. Roll the soft, multi-colored plush cube and pick the corresponding color card that was rolled. So if you roll blue, then you would pick up a blue card and so forth. Then follow the directions on the card. For example, a card may state: “Make an angry face.” The game cards feature a wide range of categories: emotions, body parts, animal sounds, counting, colors, and actions. The various activities encourage creative and active play. It’s also a great way for toddlers to bond and play together with their parents. Players: 2-4 | Time: 15 minWho doesn’t love cute squirrels? 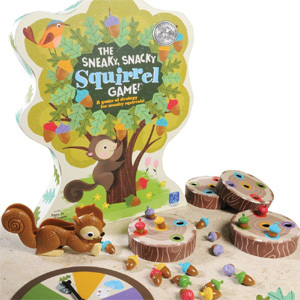 Sneaky, Snacky Squirrel is an award-winning game for toddlers. Building fine motor skills, this starter game teaches kids colors, numbers, and how to take turns. There’s no reading required, as kids only spin and count. Spin the wheel and pick up the matching colored acorn using the squirrel-shaped tweezers. Be the first to gather 5 acorns to win! Note: Contains small parts. 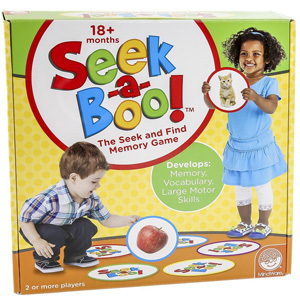 Players: 2Seek-a-Boo is a simple memory game that teaches colors, shapes, and vocabulary. Depending on your child’s development, there are so many different ways to play. To play, you flip over a card and toddlers have to find the matching card on the floor. We love that the matching component comes with large, colorful cards that can be placed on the floor. 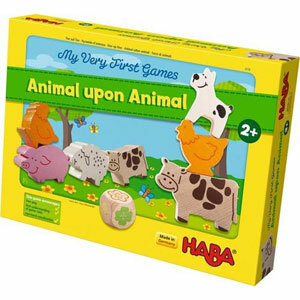 Players: 2-4 | Time: 15 minAnimal Upon Animal is like Jenga for little ones. Stacking blocks is fun, but stacking animals is even more fun. While the original game is great, we love this version for toddlers because the bright, chunky wooden animals are designed for little hands. Kids take turns stacking the animals on top of each other, trying not to knock over the tower of animals. Perfect for developing fine motor skills, it’s all about being steady and precise with your hands. With 3 game play variations, there are plenty of different ways to throw an animal party. 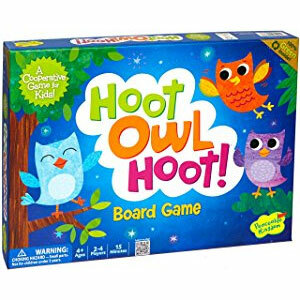 Players: 2-4 | Time: 15 minIn Hoot Owl Hoot!, there are no losers. It’s a cooperative game where everybody works as a team. In the game, you have to get the owls home before its daylight. It’s a simple color matching game with a little bit of strategy. On each turn, players play a colored card to move their owl along. If players draw a sun card, the sun will move. It teaches cooperation, teamwork, and sharing. Because there is no reading, even toddlers can play with a little help. Note: Contains small parts. Players: 2-4 | Time: 10-15 minGo Away Monster! 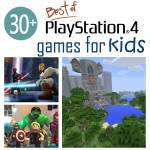 is a great first game for kids. Every little kid can relate to getting frightened of monsters. 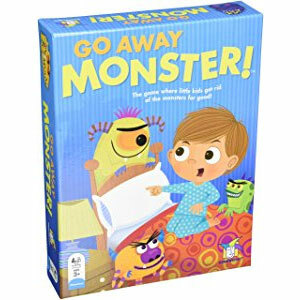 In Go Away Monster, kids have to draw from a bag without looking and avoid pulling out monsters. The goal is to use just feel to pick out only the bedroom furniture. If kids pull out a monster, they will love screaming “Go Away Monster!” We love how it empowers kids to overcome their fear of monsters while teaching shape recognition, taking turns, sharing, and cooperation. Note: Contains small parts. 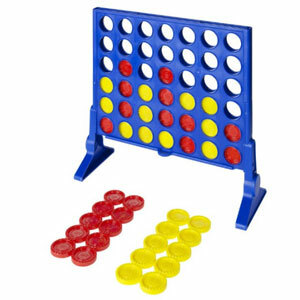 Players: 2 | Time: 15 minSimilar to Tic-Tac-Toe, Connect 4 is a classic game where players have to drop in colored coins and whoever gets four in a row wins. The colored coins can be arranged horizontally, vertically, or diagonally. While toddlers may not understand the rules, they will enjoy dropping coins into the grid and releasing all the coins over and over. Not only does it keep them busy, it’s great practice for their little hands. The game’s also great for teaching colors, counting, and taking turns. Note: Contains small parts. 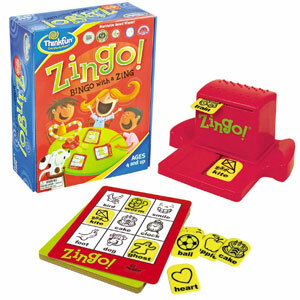 Players: 2-8 | Time: 5 minZingo is BINGO with pictures. It’s a great game to introduce toddlers to the idea of taking turns and following simple rules while building language, critical thinking, and matching skills. The Zinger machine dispenses out the little picture chips. Since it uses pictures and it’s just matching, no reading is required so even your toddler can participate. The player matching all the pictures on their card has to yell “Zingo” to win. Note: Contains small parts. Players: 2-6 | Time: 15 minSpot It Jr. is a fast-paced matching game. You place any 2 cards in front of everybody and players have to find the matching animal on both cards. Between any 2 cards there is always a match. Spot It Jr features animals, which makes it easier for toddlers to play. Players: 1-8 | Time: 20 minThe classic game of Jenga is all about stacking and crashing fun. Players start by building and stacking wooden pieces to build a tall tower. Then they take turns carefully removing the pieces one by one. But wait! One wrong move could send the whole structure toppling to the ground. Whoever drops the tower loses the game. It’s a game of skill, strategy, and luck. How do you stack up? Building fine motor skills , it’s a great game for toddlers too. Note: Contains small parts. Players: 2-4 | Time: 20 minSequence For Kids is sort of like Tic-Tac-Toe meets matching. The game has been simplified, made shorter, and been given an animal theme. Kids are each given 3 cards with pictures of animals on it. On their turn, they have to match the picture of the animal on their card with an animal on the board. The first player to get 4 in-a-row wins, so there is a bit of strategy. Since no reading is required and it has a fun animal theme, even toddlers can play. Just remove the unicorn and dragon to keep things simple. Note: Contains small parts. Players: 2-4 | Time: 30 minIn Busytown, families will race around town solving mysteries and finding hidden objects in this classic game of “I Spy”. Working together with your team, you will be trying to find hidden objects like buckets, ladders, flags, and much more. When you find an item shout out: “I Found It!” For each item found, your team advances one space. Can you solve all the mysteries, board the ferry, and get to Picnic Island before the pigs finish the food? Note: Contains small parts. Players: 2-4 | Time: 15-20 minAre you bored of memory games? 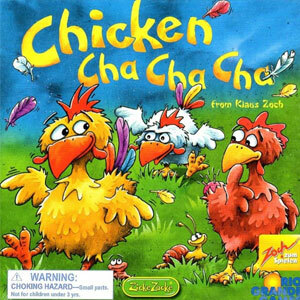 Chicken Cha-Cha is our favorite memory game because it adds player movement and silly chickens to the mix. In order to move your chicken along, you need to match the card in front of you with one of the face down memory cards in the middle. As you move along the path, the object is to jump over all the other chickens, which allows you to steal one of their feathers. Note: Contains small parts. Players: 1-8 | Time: 15-20 minIt’s a cat and mouse game! In Max, kids have to work together to get a bird, squirrel, and mouse home and up a tree before the hungry cat Max eats them. On each turn, players roll two dice which determines whether you move the cat or one of the critters. The cat starts on the porch and the critters are placed 5 spaces ahead of him. Unlike many roll and play board games, there is a bit of strategy here. Players have to decide which critter to move to keep them safe. If Max is coming close to one of the critters, you can feed him a one of 4 snacks to reset him. Note: Contains small parts. Players: 2What happens when you combine building blocks with Jenga? You get Brik Buster. 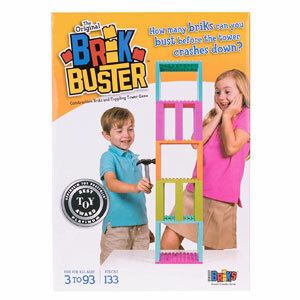 In Brick Buster, players create a 4 story high tower. Now the fun begins! Players take turns hitting the structure with the toy hammer, trying not to topple the tower. The big, chunky pieces are perfect for toddlers. Breaking towers? Now that’s a rule toddlers can get behind! Note: Contains small parts. 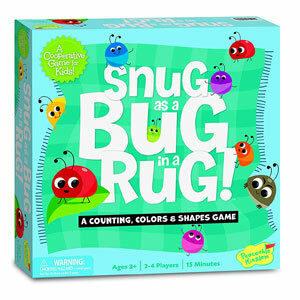 Players: 2-4 | Time: 15 minIn Snug as a Bug, a cooperative game for 2-4 players, players have to work together to move all the colored bugs under the rug before the 3 stinkbugs make their big reveal. After players roll a die and spin the spinner, they have to find the matching bug with the same color, number, and shape. If there is no matching bug, you get a stinkbug. Work together toward finding the matches to win. A simple recognition game with a focus on cooperative play, it’s perfect for teaching toddlers matching, counting, colors, and shapes. Note: Contains small parts. 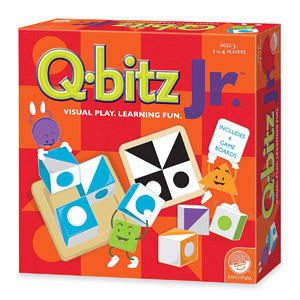 Players: 1-4Designed for ages 3 and older, Q-bits Jr. is a fast-paced puzzle game that challenges kids’ visual dexterity, pattern matching, problem-solving, and hand-eye coordination. Play the game three different ways. In the first mode, players have to arrange their cubes to match the card pattern. The second play mode adds luck into the equation with players rolling their cubes to match the pattern. Lastly, in the final play mode, players recall the pattern from memory and recreate it. After six rounds, the player with the most cards wins. What’s great? The game offers the flexibility of playing the challenges solo or with up to 4 players and there’s something genuinely satisfying about completing the various challenges. Note: Contains small parts. Toddlers are able to practice taking turns and following rules the best when they are moving. We love board games that encourage toddlers to use their whole bodies or hands. Parents love them too because they make nap time easier! 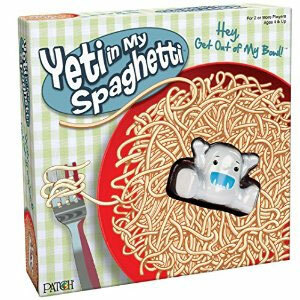 Players: 2+ | Time: 15 minHey Ma, there is a Yeti In My Spaghetti! 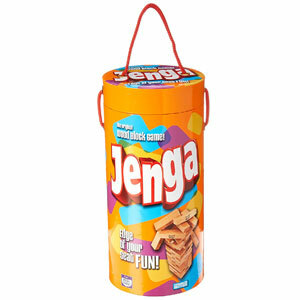 Similar to Jenga, this simple board game can bring hours of entertainment for the whole family. The board is shaped like a bowl. 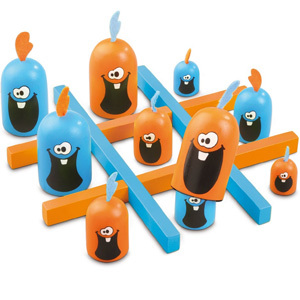 The little Yeti character sits on top of the criss-crossing plastic noodle pieces. Players take turns removing one noodle at a time. But watch out! One wrong move and the Yeti will fall into the bowl. Can you get the Yeti out without letting it fall into the bowl? Note: Contains small parts. Players: 2-4 | Time: 20 minDoes he love destroying things? Don’t let the penguin fall! 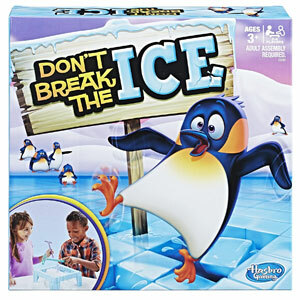 In Don’t Break the Ice, kids take turns poking out blocks of ice with a mallet while trying to keep the penguin from falling through the ice. Setup is super easy: Place all the ice blocks into the frame and you’re ready to play. Because it teaches how to take turns and builds fine motor skills, it’s a great game for younger players. Note: Contains small parts. Players: 1+ | Time: 10 minDon’t Step In It! 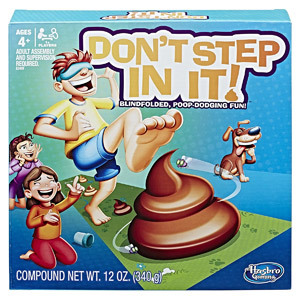 from Hasbro Games is a pooped-themed game involving a clay-like poop substance. The poop is scattered around the play area. Kids take turns spinning the spinner to determine how many steps to take. The catch? Kids are blindfolded and – you guessed it – they have to avoid stepping in the poop! While it may sound gross to parents, kids will be laughing hysterically and having a pure blast. Who will be the poop-dodging champ? Note: Contains small parts. Players: 2-4 | Time: 10 minThis just might be the most adorable game ever. A little bunny rabbit sits on top of a hill. Kids have to steal his carrots by spinning the spinner. The cool part? When one of the carrots is plucked, the bunny will jump high into the air. The player that catches him wins the game. For a toddler, this is more challenging than you might think. It’s a simple concept but a whole lot of fun for kids. 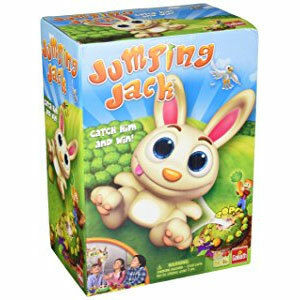 Can you catch Jumping Jack?! Note: Contains small parts. 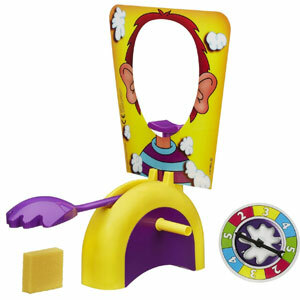 Players: 2-4 | Time: 10 minIn this simple Russian roulette game, kids first load the Pie Face arm with whipped cream. The more the merrier. Then they take turns sliding their head through the crazy contraption and spinning the spinner. Kids turn the handle the same amount of times as they spun. At any moment, somebody could get slapped in the face with whipped cream. While it’s a game of chance, it’s hysterical fun! Note: Contains small parts. Players: 2-12 | Time: 5 minOn your mark, get set, stack some pancakes! In this fun relay race, two teams race to stack pancakes in a certain order on a plate, balancing them on a spatula. To setup the game, you must place the plate and pancakes 15-feet apart. 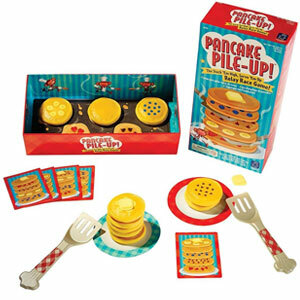 A card is drawn and players must stack the pancakes as indicated on the card. Players on each team take turns using the spatula similar to a track and field race. Note: Contains small parts. Players: 2-4 | Time: 10 minWho knew pulling teeth could be so fun? 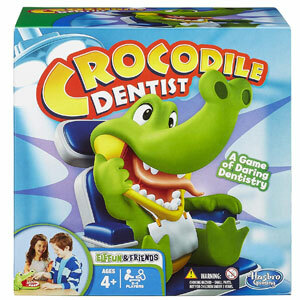 Crocodile Dentist is a super basic game for really young kids. In this game, players take turns pulling one of the crocodile’s teeth out in hopes his mouth doesn’t snap shut. Avoid getting chomped on to win. The snap doesn’t hurt little fingers. It is essentially Russian roulette, so it can even be used to determine who goes first. Although it doesn’t have a ton of replay value, two and three year olds get a kick out of the game as it’s simple, fun, and generates laughter. Note: Contains small parts. Players: 2-6 | Time: 15 minWho doesn’t enjoy knocking down blocks? Stack Up! 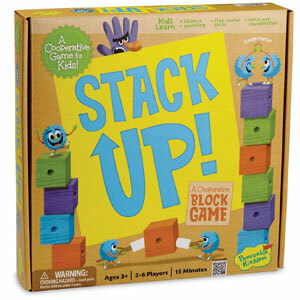 is a simple stacking game for 2-6 players in which kids have to work together to stack 12 blocks before the Stack Smasher knocks the tower down. Players take turns spinning, completing challenges, and stacking blocks. 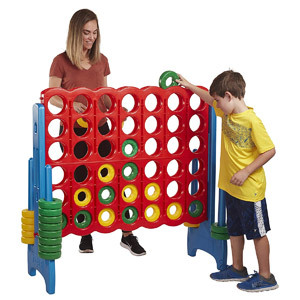 With three different skills levels and the ability to grow with your child, it’s a great cooperative game that helps kids develop fine motor skills, balance, and hand-eye coordination as well as teaches counting and the importance of teamwork. Note: Contains small parts. Players: 2 | Time: 5 minWho’s ready to dance and have fun? 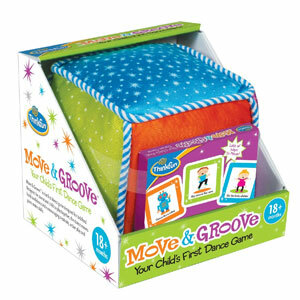 ThinkFun’s Move & Groove Game gets kids up off the couch and physically active. Roll the colored cube and choose the corresponding color card. Now perform the action on the card. For instance, a card may state: “Waddle like a duck,” so your child would attempt to complete that action. The best part? There are no winners or losers here. The game features 6 categories: Let’s Pretend, Movement, Body Parts, Classics, Silliness, and Work Out. A storage pocket on the cube conveniently allows you to store all the cards. This simple game is perfect for developing your child’s gross motor skills, coordination, and balance. 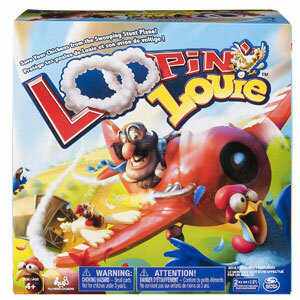 Players: 2-4 | Time: 10 minLoopin’ Louie is a fast-paced, addictive board game where players have to save their chickens from a swopping stunt plane. What’s cool? Every time the game changes since you never really know when Louie will take a dive. It’s all about timing your presses to launch Louie into the air and over your chickens. 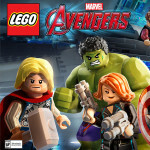 The game features two skill levels – easy and hard – and it’s loads of fun. It showcases that even the simplest ideas can be super fun. We love that it is as entertaining for kids as it is for adults and spectators alike and games don’t last very long. Think you’ve got what it takes to save your chickens? The player with the most chickens wins. 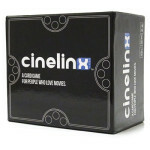 Developing hand-eye coordination, it’s a fun novelty game worth adding to your game collection. Note: Contains small parts. Players: 1Ready to wiggle, giggle, and have silly fun with your toddler? This simple game gets kids active while having fun. To play choose a card and your child has to perform the action. Kids will be performing various actions from balancing and hopping to marching and more with their banana prop. It’s a fun game for developing socio-emotional skills, gross motor skills, coordination, vocabulary and more. Additionally, it’s a great way for parents to bond with their child while monkeying around and learning in a fun way. Players: 1-4 | Time: 5 minHere Fishy Fishy! 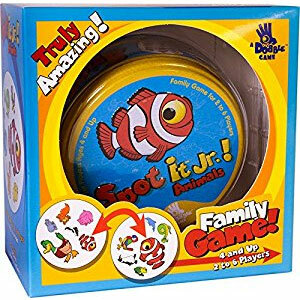 In Fishy Fishy, kids will enjoy catching fish. It’s a really basic game first game that teaches taking turns and color recognition. With big chunky fish that can’t be swallowed, even the smallest children can play. Kids have to roll the colored die and fish for that colored fish. The fish are magnetic, easily attaching to the magnetic hook. Once they get the fish, they have to fill in their puzzle board according to the fish they caught. There’s a dexterity, tactile, color, and shape component. Players: 1-6 | Time: 5 minBe careful not to rock the monkey. 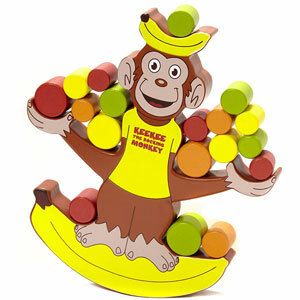 In this dexterity game, kids take turns carefully placing one of the wooden “balls” on KeeKee the Monkey without tipping him over. The first person the tips him, loses the round. While the pieces can be placed on his arms or on top of his head, kids will to keep the rocking monkey balanced. If Keekee loses his balance, he will spill the balls, which leads to a lot of laughter. Note: Contains small parts. For toddlers, we love games that focus on cooperation rather than competitiveness because these games build a sense of togetherness. A lot of toddlers don’t like to share or lose. In cooperative board games everybody has to work together to meet a common goal. You can still lose in a cooperative game but everybody loses together. Here are our favorite cooperative board games for little kids. Players: 1-4 | Time: 15 minWhat if Candy Land was cooperative? 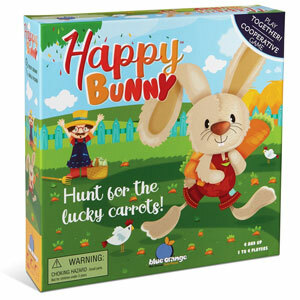 In Happy Bunny, players move around the board from colorful square to colorful square plucking carrots. After landing on the square, kids have to pluck the same number of carrots as indicated on the square. At the end, the bunny has to pluck more carrots than the farmer for everybody to win. As kids are playing, they are learning counting, color recognition, and the importance of working together. Note: Contains small parts. Players: 2-5What’s the sweetest game ever made? 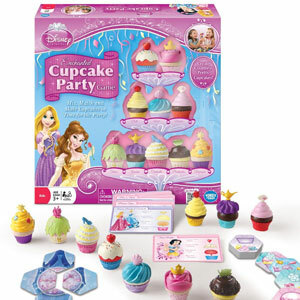 It’s the Disney Princess Enchanted Cupcake Party Game designed for ages 3 and older! You’re invited to a magical party with the Disney Princesses. In this game, kids will mix, match, and make cupcakes in time for the party. Follow the “recipe” card ingredients to create your cupcakes. There are literally thousands of unique cupcake combinations. Girls will have a blast creating and decorating a variety of pretty cupcakes. How many can you make for the big celebration? We love that the game promotes creative expression and playing together. Note: Contains small parts. Players: 2-4 | Time: 15 minIn Count Your Chickens, the chicks have flown the coop, and you need to round them up by working together and return them to the coop. Spin and move to the corresponding space as indicated on the spinner. Count the number of spaces you move and gather up the same amount of chicks. Then it’s the next player’s turn. Once all the chicks have been gathered, everybody wins. What’s great? No reading is required so even toddlers can join in on the fun. Kids will have fun learning to count, taking turns, following directions, and cooperating to win. Note: Contains small parts. 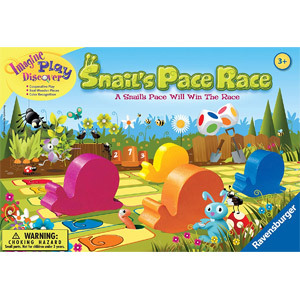 Players: 2-6 | Time: 10 minSnail’s Pace Race is an award-winning, cooperative 2-6 player game for toddlers. Be the first player to race your colored snail to the finish to win. What’s cool? Even the losers win in this game! Players roll the color-coded dice to move the corresponding colored snails one space forward. 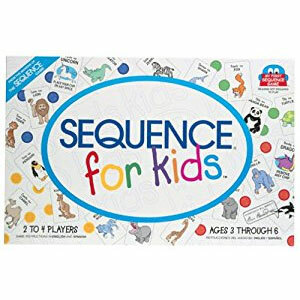 It’s a great game for teaching younger players basic board game skills, such as taking turns, dice play, and piece movement. This simple and quick game incorporates counting, cooperative play, color recognition, and memory, and even helps develop your child’s social skills. Traveling at a snail’s pace, who will win the race? Note: Contains small parts. Players: 1-8 | Time: 20 minIt’s a cat and mouse game! 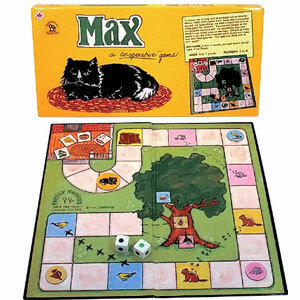 In Max, kids have to work together to get a bird, squirrel, and mouse home and up a tree before the hungry cat Max eats them. On each turn, players roll two dice which determines whether you move the cat or one of the critters. The cat starts on the porch and the critters are placed 5 spaces ahead of him. Unlike many roll and play board games, there is a bit of strategy here. Players have to decide which critter to move to keep them safe. If Max is coming close to one of the critters, you can feed him a one of 4 snacks to reset him. Note: Contains small parts. Toddlers learn the best when they are having fun. 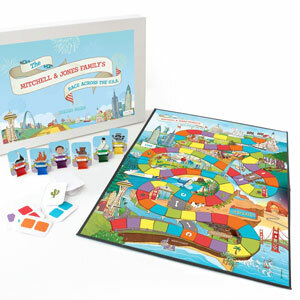 Educational board games can teach color, number, and shape recognition. It’s never been easier to learn ABCs and 123s than with these board games. 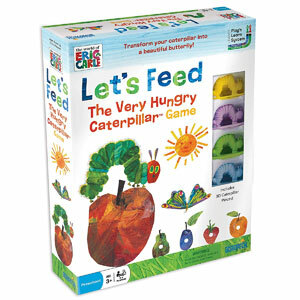 Players: 2-4 | Time: 15 minCombining counting, collecting and building and recommended for ages 3 and older, Let’s Feed The Very Hungry Caterpillar Game is a fun game for 2-4 players. No reading is required, so even pre-readers can play, learn, and understand the game. Players will embark on a journey transforming their caterpillar into a beautiful butterfly. Note: Contains small parts. 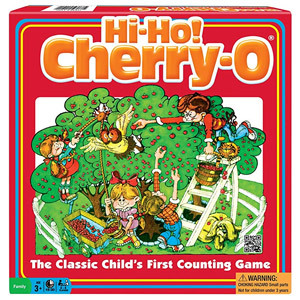 Players: 2-4 | Time: 10 minA favorite for over 50 years, Hi-Ho Cherry-O, a first counting game for kids, delivers laughs and fun in spades. Of all the versions on the market, this is the most like the original game. Kids have to pick fruits from the colored trees and fill up their buckets. The first one to fill up their bucket wins. 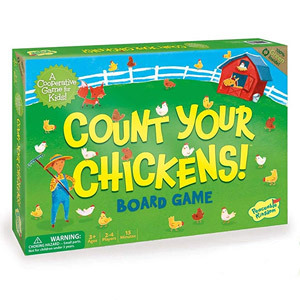 It’s a great game for developing early math skills like counting, adding, and subtracting. Note: Contains small parts. Players: 2-4 | Time: 10 minRaccoons have invaded your closet and are throwing a party. Help them get dressed! 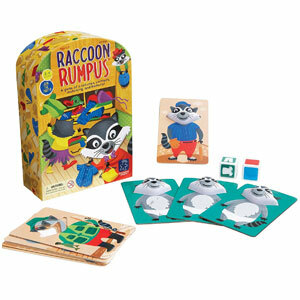 Raccoon Rumpus is a fun color matching game for toddlers for 2-4 players that involves critters, crazy costumes, matching, and memory. Each player gets a raccoon card and players take turns rolling both dice, searching the cards for the one that matches. Players have to be the first to collect 5 costumes for their raccoon. To collect a costume, kids roll a pair of die and pick up the costume that matches the dice. The fun part? If kids roll an underwear, they lose all their costumes, while rolling a rainbow allows you to choose any costume. Note: Contains small parts. Board games are great for bringing families together. Toddlers love games where they don’t have to make decisions or sit for a long time. 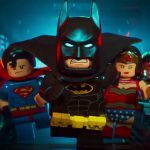 Games should be about 15 minutes long at most. They don’t mind games that are based on pure luck as long as you are playing along. While they may not play by the “rules” and need some parental assistance, they will eventually learn to play on their own. Players: 2-4 | Time: 30 minWho wouldn’t love a candy covered game? Candy Land is a classic. It’s a delicious race to the castle with this simple and colorful game. If they know their colors, Candy Land is the perfect first board game for toddlers. Toddlers move around the board by spinning and matching colors. Since it’s all about color matching, they don’t need to be able to read or understand numbers. Draw a colored card and move to the nearest colored space. Note: Contains small parts. 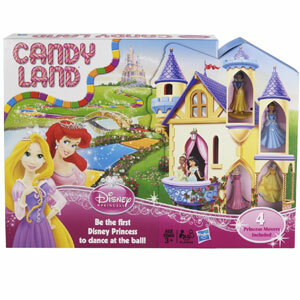 Players: 2-4 | Time: 30 minIn this special Disney Princess version of Candy Land, girls have to be the first Disney Princess to dance at the ball! Made for Disney Princess fans, the game features a fun Disney themed makeover. 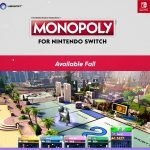 But it’s the classic Candy Land gameplay you know and love. The game rules are simple: Kids draw color coded cards and move to the nearest colored square. It’s a great basic game for teaching toddlers color recognition. Will you be the first princess to dance at the ball? Note: Contains small parts. Players: 2 | Time: 15 minEveryone’s favorite party game is now super-sized. Standing 4-feet tall, it’s like Connect 4 where you have to get 4-in-a-row to win but on a much larger scale. It’s perfect for indoor or outdoor fun and comes with a handy travel case. While toddlers may not fully understand the strategy component to the game, they will still enjoy dropping the pieces into the game board. However, it’s a game they can easily grow into and enjoy for many years to come with the whole family. Think you have what it takes to win?! Note: Contains small parts. 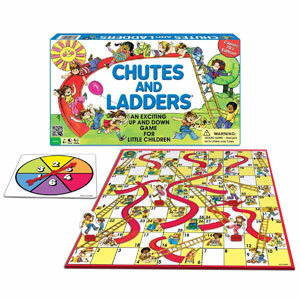 Players: 2-6 | Time: 30 minIn Chutes & Ladders, kids have to climb ladders and avoid chutes. The game comes with a spinner that kids have to spin to move along the board. As children climb up the ladders and go down the chutes, they will learn how to count up to 100. The first one to the top wins the game. There is no reading required. Although the game relies heavily on luck, it’s a great first game for toddlers since they learn basic game rules, dice play, turn taking, and counting. Note: Contains small parts. Players: 2-4 | Time: 20 minAn award-winning game designed by a first grader suitable for ages 3 and older, The Ladybug Game takes kids on a brand new adventure every time you play. 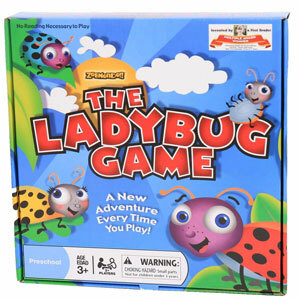 With an intriguing story and easy play mechanics, kids will have fun as they try to get the ladybugs home in this simple game. Pick a card and move the required number of spaces. The best part? No reading is required so most pre-readers can play without help. Note: Contains small parts. 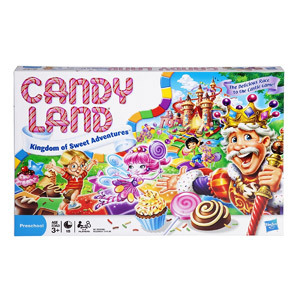 Players: 2-4 | Time: 30 minIf they can recognize color, Candy Land is great for toddlers but this board game can be personalized. You can personalize up to 6 different game pieces so everybody in the family can play together. While the theme involves a race across America, the game is played just like Candy Land. Players draw colored cards and move to the nearest color on the board. Note: Contains small parts. Players: 3-6 | Time: 30 minBrace yourself for a ton of laughs! Now even toddlers can join the family fun and play Charades. 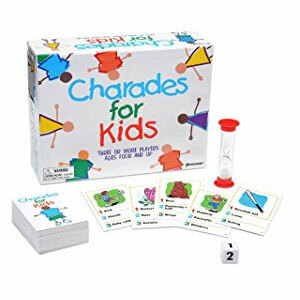 Specially designed for kids and 3 or more players, this version of Charades features cards with illustrations and words so even kids can play along even if they can’t read yet. However, the words and pictures reinforce early reading. Kids will love acting out the clues while their family attempts to correctly guess their actions before time runs out. Note: Contains small parts. Players: 2 | Time: 5 minLooking for a fun alternative to Tic-Tac-Toe? A multiple award-winner, Gobblet Gobblers is a 2-player strategy game similar to Tic-Tac-Toe but with a fun twist. In fact, the game plays just like Tic-Tac-Toe where you have to get three Gobblers in-a-row of the same color. The catch? You can gobble up your opponent’s piece for a surprise victory. The pieces can nest inside one another. Once kids get the hang of it, they’ll enjoy gobbling up their opponents and probably sometimes even beat their parents. Note: Contains small parts. Memory and matching games are great for teaching toddlers how to categorize and sort objects. These games feature cards that have matching pairs that are placed face down. Kids need to remember where the matching pairs are when they flip over the cards. Here are some of our favorite memory games. Players: 2Remember the game of Memory? 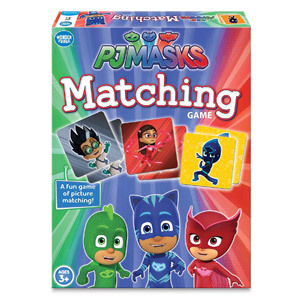 Children will love putting their memory to the test with this fun PJ Masks-themed matching game. 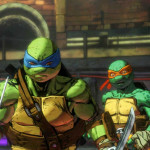 The game features cool artwork inspired by the show. Suitable for ages 3 and up, it’s perfect for building matching and memory skills and for PJ Masks fans. Are you ready to show off your matching and memory superpowers? 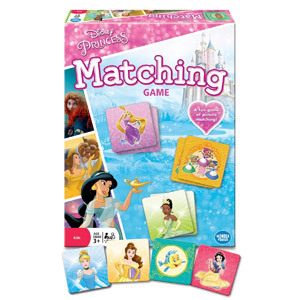 Players: 2The Disney Princess Matching Game is a fun game of picture matching and memory skills. The game features 72 beautifully illustrated Disney Princess picture tiles. It’s just like the classic game of Memory with a fun Disney Princess theme. Start with the tiles placed face-down. Flip two over at a time to find matching pairs. The player with the most pairs wins. The game can be played solo or with more than one player. 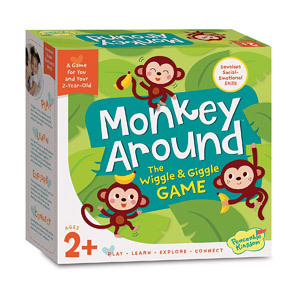 It’s a great game for developing your child’s matching and memory skills in a fun way. 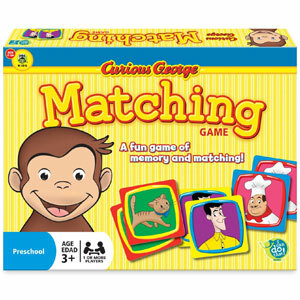 Players: 2The Curious George Matching Game is a perfect game of memory and matching for toddlers featuring cute and colorful pictures of Curious George and friends. The game features 72 picture tiles and kids’ memory skills will be put to the ultimate test! Start with the tiles placed face-down. Flip over two cards at a time to try and find a matching pair. Finding pairs earns you cards, otherwise flip the cards back over and remember the positions. Gather the most matching pairs to win. Encouraging taking turns and playing together, it’s a fun and simple game for developing your little one’s memory and matching skills. Three year olds enjoy this most, as it’s fun and helps builds vocabulary. Players: 2Now even toddlers can play dominoes. 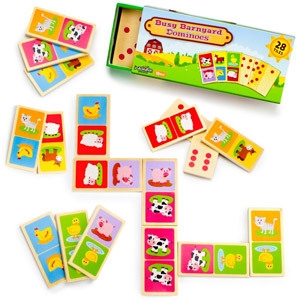 Picture Dominoes feature fun pictures that kids can match and play dominoes. Toddlers don’t have to know numbers because they just have to match the animals. The coolest part? On the back, the dominoes are numbered too so it’s great for counting too. 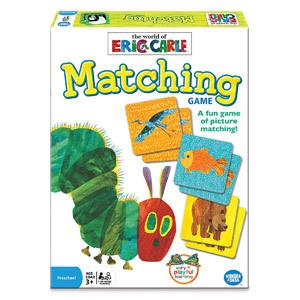 Players: 2Designed for one or more players, Eric Carle Matching Game is a fun game of picture matching for toddlers and their families. Played like the classic game of Memory, it’s a great game for developing your child’s matching and memory skills. 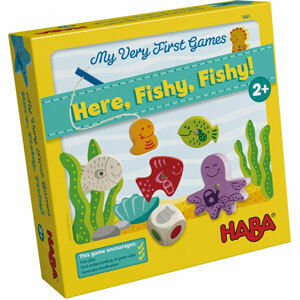 Kids will be matching beautifully illustrated images of fun animals like fish, bears, birds and more. Players: 2-4 | Time: 10 minPengaloo, a multiple award-winning game, delivers a fun twist on the classic game of Memory. 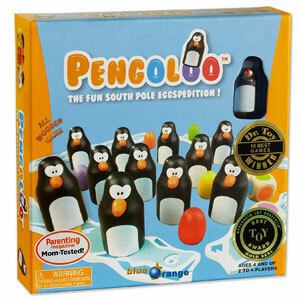 The game is played with 12 wooden penguins that conceal colored eggs. Players roll the colored dice and have to find matching colored eggs under the penguins. Similar to the classic game of Memory, the idea is to remember the colored eggs under the penguins. Collect 6 penguins on your iceberg first to win. After toddlers master the basic game, there are a couple of different variations to play. The game is good for developing memory, color recognition, and fine motor skills. 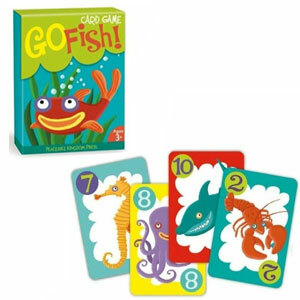 We have thrown in a few of our favorite card games for toddlers. Most toddlers probably won’t be able to sit and play card games without some guidance. We’ve chosen card games that don’t require reading and are based on simple concepts like matching and color recognition. 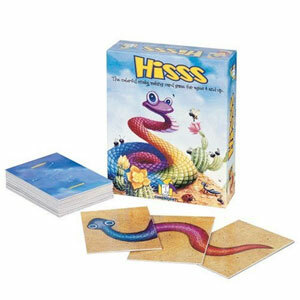 Players: 2-5 | Time: 15 minHisss is a card game designed for younger children. In this color-matching game, the object is to build the largest snake. But each snake must have a head, body, and tail. All of the colored body parts have to match as well. Start with all the cards face-down and flip over a card. Players take turns picking up cards and can choose either to build a new snake or add it to their existing snakes. If you complete a snake, add it to your snake pit. The player with the most tiles in their snake pit wins. The game is great for promoting counting, color recognition, and visual logic. Unlike many games that get boring after a while, 3 year olds and their parents will actually enjoy playing this game together. Players: 2-6 | Time: 20 minGo Fish! is a classic card game that at its core teaches kids how to play well together. The object of the game is to collect 4 matching sets of cards. When a player asks for a card and you don’t have it in your hand, you tell them to “Go Fish,” and they draw from the draw pile. Otherwise you need to give them the card they asked for. The player with the most sets at the end wins. The cute and colorful artwork will appeal to kids and the card numbers are easy to read. Families will enjoy playing this old favorite with their loved ones, as it’s simple, fun and toddlers learn basic game rules, taking turns, and number recognition. 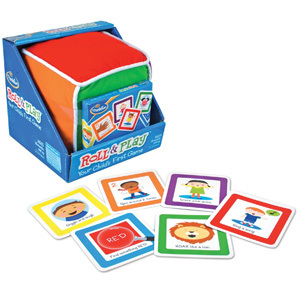 Players: 2-4Designed for early counters, Richard Scarry’s Busytown Cars and Trucks Card Game reinforces numbers and counting. Perfect for little hands – these large, colorful, and beautifully illustrated number/picture cards feature the numbers 1 to 12 with a variety of cars and trucks. The player that has the most passengers wins the round. 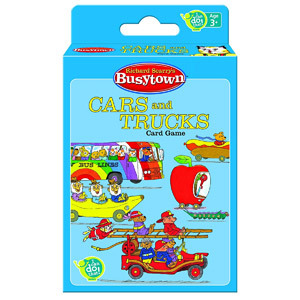 Kids will love the character artwork based on Richard Scarry’s classic book, “Cars and Trucks and Things That Go”. Players: 1-4Who doesn’t love a good story? 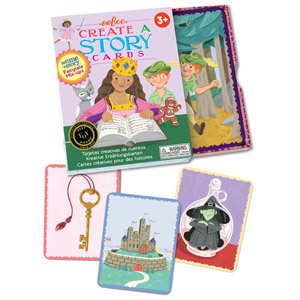 Honored with an Oppenheim Best Toy Award, Create and Tell Me A Story Cards from eeBoo feature a set of beautifully illustrated cards with common fairy tale characters, locations, and objects. Kids are encouraged to think creatively to come up with their own logical or hilarious fairy tales, as parents either randomly or selectively choose a card from the deck. Bedtime stories will never be the same! More Good Board Games for Toddlers? What are you favorite board games for toddlers? Let us know in the comments what board games we should add to our list.